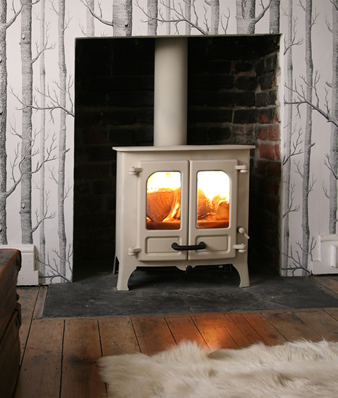 The Charnwood Island I, with an output rating of 5kW, is the baby of the Island range. This is not to suggest a lightweight performance u2013 any wood burning stove which comfortably handles logs up to 370mm (14.5") in length carries serious room-warming potential. To the eye, the Island I incorporates all the traditional wood stove design features you would expect, without losing any of its distinctive Charnwood pedigree. With a choice of eight colours, functional uncomplicated looks, and gently understated curves, the Island I is guaranteed to look good wherever it is located and will suit both modern and traditional settings. The build is solid steel with a cast iron door, clear ceramic glass, and internal fire bricks. One exceptionally useful design aspect is the cool-to-touch door handle feature. This makes reloading of logs an easy, tool-free, bare hands operation – though Charnwood do suggest using a cloth or a glove whenever your Island I is in overdrive! The Island I features the Charnwood patent air management system to control air flow through the stove. This revolutionary design, using a combination of four separate air chambers, really is a breeze – you can regulate all burning operations with precision via just one simple control. Using cleanburn airwash technology, the Island I delivers super-efficient double combustion u2013 the emissions released in the first, or primary, burning phase are then captured and burnt again during a secondary phase. This clever, energy-efficient process recovers extra heat from your fuel, leaving behind less ash and a cleaner chimney. Island I wood stoves also come equipped with the Charnwood converting grate. Rated the best on the market, Charnwood are justifiably proud of this grate which can be altered at will to gain the best burning conditions. Using a tool-operated external lever, the cast iron grate bars can be set to a flat/closed position, best for wood burning; or an open-bar position which is best if you burn smokeless fuel or coal. This can be done (with closed doors) whilst the fire is in use – which is very handy for a coal top up on those winter evenings when your heating needs that extra boost. The lever is also great for fire riddling with the ash dropping neatly through the bars to the ash pans below. A convenient, drop-down throat plate for easy chimney sweeping through the stove concludes our brief inspection of Charnwood's ultra u2013efficient, eco-friendly Island I. For more information call into our multi fuel stove and fireplace showroom in Fleet Hampshire.